Sinus or sinusitis is the medical term for the inflammation of the sinus passage which often leads to blocked nose, influenza, cough and cold. Medically paranasal sinuses that have mucous lines are affected in this condition which can cause problems in breathing and even severe headaches. Fever is also a very common symptom of sinus and can reach to high degrees in extreme cases. 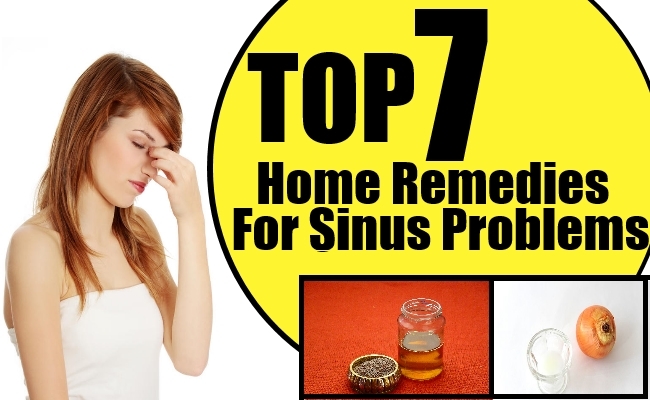 Some of the best home remedies for sinus are listed below. Both ginger and garlic are known to have very strong smell which can heal the mucus membranes that are blocked in sinus. Extract the juice of ginger and take one teaspoon daily in empty stomach. This will not just reduce the inflammation but will also protect the body from catching sinus infections easily. Soak some cumin seeds overnight in water and boil the liquid in the morning. Drink the water or just the steam with deep breaths. This will help in a long way in keeping sinus at bay and is a popular home remedy. It is one of the most popular home remedy for sinus. Just add a few drops of eucalyptus oil to bathing water every day or just add the oil to a piece of cloth and keep it in your handbag. Sniff the cloth as many times as you can for an unblocked nasal passage. While onion might not be as famous as ginger or garlic but it definitely helps in many cases to treat sinus. Just extract some fresh onion juice and put two drops in each nostril. It will open all blockages and can be taken for many times in a day without any side effect. In Asian countries, mustard is very popular for curing sinus. You can either use raw mustard oil directly onto the nostrils or use mustard seeds. For using mustard seeds, boil the seeds in water for 20 minus and put the oil in the nostrils. This will help in clearing the nasal passage. There are many medicinal properties of cloves that have been discovered and it helps in sinus as well. Add some clove oil to a few drops of water and sniff the liquid. You can also use cloves in grinded form and boil it in water for smelling. Cinnamon too is known to same similar qualities and can be boiled and smelled in normal nose blockage and stiffness. Taking hot liquids is very beneficial in sinus problems. You can make different teas like basil tea, clove tea or ginger tea. Just add any of the above ingredients to tea and bring to boil. Drink the liquid while it is still hot for instant relief from sinus. Ginger tea can cure even common colds if taken at regular intervals.Try to maintain a healthy lifestyle and avoid going to dusty places to avoid sinus. If daily care is taken, treating sinus won’t need any medical prescriptions and the natural home remedies will work finely.